Free Shipping Included! 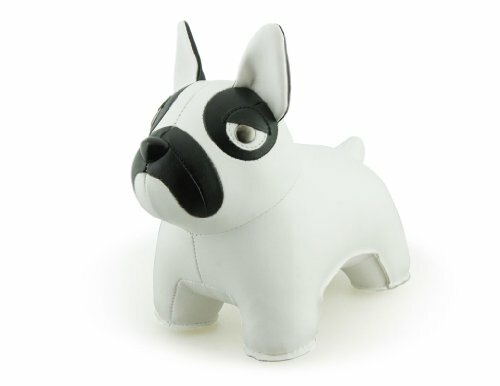 Zuny Classic Series French Bulldog White Animal Bookend by Zuny at Animal Backgrounds. MPN: ZCBV0059WHT. Hurry! Limited time offer. Offer valid only while supplies last. Eye-catching, elegant room decor in a wide variety of designs. Luxurious look and feel. Ultra-smooth ''skin''. Heavy in hand. Very well finished. Eye-catching, elegant room decor in a wide variety of designs. Luxurious look and feel. Ultra-smooth "skin". Heavy in hand. Very well finished. Appropriate for formal or casual settings. Tasteful additions to bookshelves, desks, tables, etc. Made of friendly faux leather, polyester fiber, and iron pellets. Designs with fur use high-quality synthetic fur. Ages 6 years thru adult. Sold individually, not as a pair. French Bulldog measures 8.25" x 4.75" x 7.75" high. Eye-catching, elegant room decor in a wide variety of designs. Luxurious look and feel. Ultra-smooth "skin". Heavy in hand. Very well finished. Appropriate for formal or casual settings. Tasteful additions to bookshelves, desks, tables, etc. Made of friendly faux leather, polyester fiber, and iron pellets. Designs with fur use high-quality synthetic fur. Ages 6 years thru adult. Sold individually, not as a pair. French Bulldog measures 8.25" x 4.75" x 7.75" high. If you have any questions about this product by Zuny, contact us by completing and submitting the form below. If you are looking for a specif part number, please include it with your message.